County of Radnor: Abbey cwm Hir or Gollan and Cefn Pawl, Cefnllys, Llanbadarn fawr, Llanfihangel Helygen or Fach, Llansaintffraed Cwm toyddur (2), Llanyre (2), Nantmel (3), Rhayader Gwy (2), St. Harmons (2). The population falling within the Union at the 1831 census had been 5,970 with parishes ranging in size from Llanfihangel Helygen or Fach (population 101) to Nantmel (1,294). The average annual poor-rate expenditure for the period 1834-36 had been £2,839 or 9s.6d. per head. In 1838, the Poor Law Commissioners authorised an expenditure of £1,100 on a workhouse to accommodate 60 inmates. Remarkably it was to be another forty years before a workhouse was actually built. Rhayader, like a number of other unions in rural central Wales (Builth, Lampeter, Presteigne, and Tregaron) Rhayader was opposed to the construction of a workhouse and the expenditure it would involve in its erection and maintenance. Under increasing pressure from the Poor Law Board, and its successor the Local Government Board, the Board finally agreed to its construction in the early 1870s, but even then still prevaricated over such matters as the choice of site and the capacity of the building. Originally intended to accommodate 60, they successfully petitioned for this to be reduced to forty. The new workhouse was finally erected in 1877-8 on the north side of the Builth road about half a mile to the south-east of Rhayader. Designed by Stephen William Williams, the County Surveyor for Radnorshire, its construction cost around £4,000. It had three-storey main block, with a T-shaped layout — the rear wing probably being just a single storey. The site layout is shown on the 1905 map below. 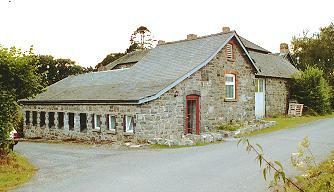 Rhayader main building from the west, 2000. Rhayader rear of main block from the east, 2000. A vagrants' ward, porter's room and labour shed were added in 1879. Rhayader vagrants' block from the east, 2000. The Board of Guardians originally appointed as Master and Matron a local farmer and his wife Mr and Mrs Hamer of Bryncennarth, St Harmon. However, the Local Government Board blocked the Hamers' appointment because of their lack of experience in running a workhouse, a deficit shared by everyone else on the Board of Guardians. In their place, Mr Samuel Rose and his wife Sarah, who had previously held the posts at the Belford union workhouse, were appointed at a special meeting on April 30th, 1879. The Master received a salary of £40 per annum and the Matron £20, plus food and accommodation. 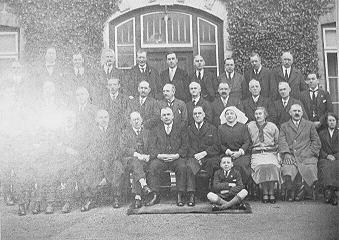 Rhayader Board of Guardians, early 1900s. The workhouse closed in 1932. The Royal Cambrian School for the Deaf was evacuated from Swansea in 1941. 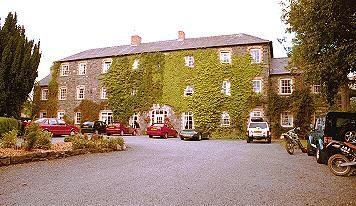 The boys' section initially relocated to Dolgerddon Hall, Rhayader, and then to the former Rhayader workhouse. The boys remained there until the opening of the Llandrindod Wells School for the Deaf in 1950. The building has also been used as a factory and as a local fire-drill site. 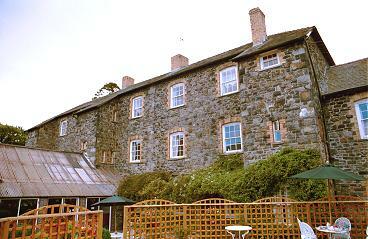 In 1989, it was converted for use as a hotel. Powys County Archives Office, County Hall, Llandrindod Wells, Powys, LD1 5LG. Few records survive — holdings include: Guardians' minute books (1836-89, 1904-20); Ledgers (1902-30); etc. Kelly's Directory of Monmouthshire and South Wales, 1895.